Discussion in 'Gaming Reviews' started by T_Riddler_, Jun 25, 2012. History teacher Lee Everett has been arrested for the alleged killing of a state senator who was sleeping with his wife. The story starts with Lee leaving Atlanta under police supervision to be taken to jail. The cruiser lee and the officer are driving in runs into a zombie or “walker” and crashes off the highway. You awake from the car crash in some woods the police officer is dead and you have injured your leg. You make your way from the woods to a house where you meet a girl called clementine she is home alone awaiting her parents arrival. You decide from an answering machine message from the parents that they might not have made it and ask clementine to go with you and protect her from the walkers. On leaving the house you meet another character Shawn Greene which lets the story continue onto a farm owned by Shawn’s father and eventual visit to Macon Georgia to look for your family. The game is a cross genre of both adventure and action with some role-playing elements. 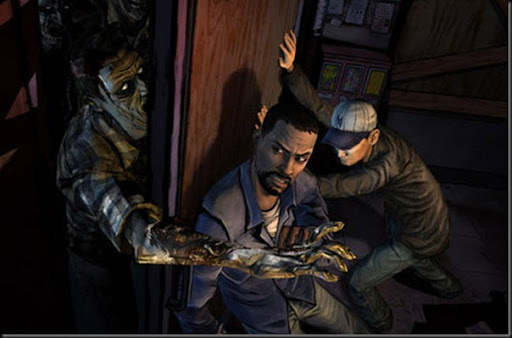 Like other telltale titles the player makes use of a inventory which is then used to interact with the environment. Unlike other titles the character has a limited time to interact with surroundings, characters etc so if left to long they can die in the process. Lee is the only controllable character but he is able to interact with the other survivors. Taking sides against someone in the group which then puts doubt later from them when a decision has to be made. On the other hand the person you took sides with has more of a chance of helping you either in the same way from someone in the group. or more likely to help if you are being attacked or wanting to search a area for items. At some points lee will have to choose whom to save from walkers by letting the other individual die some of the game plot will change while other parts will remain unchanged. It has been said that actions taken from the first chapter will remain (if characters survive) right through the remainder of the chapters still to be released. The graphics have a comic book art style to them which shows some nice detail in the characters and surroundings. The voiceovers for the characters are good they help you enjoy the game more in interacting with them almost like watching a tv episode. I have watched the walking dead tv show and I also played the previous telltale game back to the future. I enjoyed both so when I heard they where releasing this I thought it would be worth a look. It is a episodic game so the basis of my review for now is only one chapter but from what I have played so far I look forward to the other episodes being released to see how the story progresses.